The time: seven minutes, 18 seconds on the NÃ¼rburgring-Nordschleife. The power: 620 hp. The weight: 3,020 lb in road trim with all fluids on board. 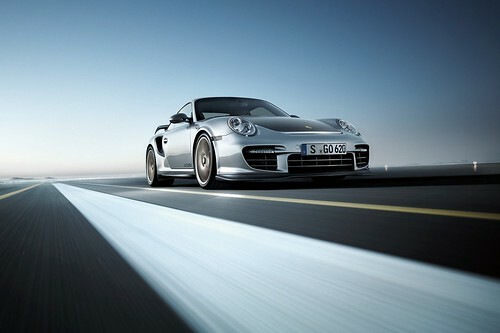 The car: the new 2011 Porsche 911 GT2 RS. The latest 911 is the fastest and most powerful road-going sports car ever built in the history of Porsche. With horsepower up by 90 and weight down by 154 lbs in comparison with the previous 911 GT2, the new 911 GT2 RS has a power-to-weight ratio of just 4.9 lbs per horsepower, by far the best power/weight ratio in its class. These are the ideal ingredients for an ultra-high-performance sports car with supreme agility and truly blistering performance on the road. Perfectly illustrating Porsche Intelligent Performance, the 2011 GT2 RS achieves a reduction of approximately 5 percent for both fuel consumption and CO2 emissions when compared with the previous 911 GT2. The 3.6 liter six-cylinder boxer engine features two variable turbine geometry turbochargers and provides power to the rear wheels exclusively through a six-speed manual gearbox. Equally impressive stopping power comes from Porsche Composite Ceramic Brakes. The combined effect of these developments is evident on the racetrack. In fact, the ultimate 911 accelerates from 0-60 in 3.4 seconds, boasts a top-track speed of 205 mph and laps the famed NÃ¼rburgring-Nordschleife racetrack in just 7 minutes and 18 seconds. 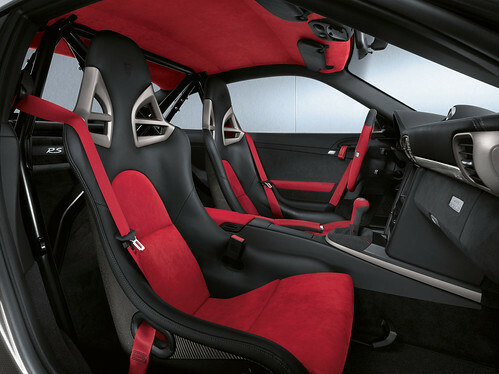 In its looks, the new 911 GT2 RS stands out clearly from the other 911 models through the lavish use of carbon-fiber-reinforced components with a matt-black surface finish, even wider wheels (including flared wheel arches at the front), new light-alloy wheels with central locking and â€œGT2 RSâ€œ model designations on the doors and rear lid. Matte-finish carbon also graces the redesigned front spoiler lip and the 3/8th of an inch (10 mm) taller rear spoiler lip â€“ which both enhance aerodynamics and provide extra downforce. Starting saving those pennies now. You’re going to need a lot of them if you want get your hands on the ultimate 911. Limited to just 500 units worldwide, the 911 GT2 RS will be available in the U.S. October 2010 and will have a MSRP of $245.000. The GT2 RS is making its world debut at the Moscow Auto Show on August 25th 2010.